Dated the 31st July, 2018. Sub: Clarification / modification of the guidelines issued regarding simplification of referral system under CGHS vide OM Z 15025/117/2017/DIR/CGHS dated 15/01/2018. 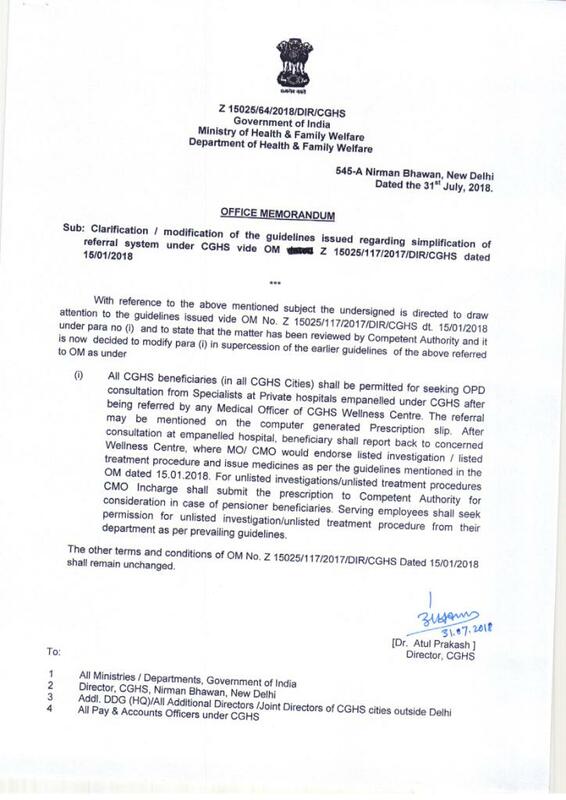 (i) All CGHS beneficiaries (in all CGHS Cities) shall be permitted for seeking OPD consultation from Specialists at Private hospitals empanelled under CGHS after being referred by any Medical Officer of CGHS Wellness Centre. The referral may be mentioned on the computer generated Prescription slip. After consultation at empanelled hospital, beneficiary shall report back to concerned Wellness Centre, where MO/ CMO would endorse listed investigation / listed treatment procedure and issue medicines as per the guidelines mentioned in the OM dated 15.01.2018. For unlisted investigations/unlisted treatment procedures CMO lncharge shall submit the prescription to Competent Authority for consideration in case of pensioner beneficiaries. Serving employees shall seek permission for unlisted investigation/unlisted treatment procedure from their department as per prevailing guidelines. The other terms and conditions of OM No. Z 15025/117/2017/DI R/CGHS Dated 15/01/2018 shall remain unchanged. Click to view/download CGHS O.M.